What to do in Montreal this summer – its 375th! Montreal was founded by the French in 1642, making it one of the oldest cities in Canada. This means that it’s turning 375 years old this year, and it won’t let us forget it. There is so much to do in Montreal this summer that it’s hard to keep it all straight, from live music in parks, to special exhibits, to street theatre, to big multimedia presentations. Fortunately you can find a ton of information on the site of Tourism Montreal, including a whole section about the 375th anniversary. Also check out 375mtl.com, a website focusing solely on special anniversary events. In this post, I want to highlight a few special events that will be going on throughout the summer. The best part: many of them are free. The recurring theme this year is illuminations! On May 17, Montreal’s official birthday, the Jacques Cartier bridge was lit up for the first time. Entitled Living Connections, the lighting show is a legacy project that will occur every night for the next 10 years. This isn’t just any light show. The intelligent programming adapts to the season and the city’s energy. What does that mean? For starters, a different colour is used for each day of the year, changing subtly from shades of green (spring) to orange to red to blue as the seasons progress. Secondly, the intensity, speed, and density of the light varies depending on how often Montreal is mentioned on Twitter using hashtag #IlluminationMtl! Every hour after dusk, a 5-minute animation visually translates Montreal’s mood based on daily data such as weather, traffic, news, major events, etc. At midnight, the bridge cycles through all 365 colours, and finally at dawn, the illuminations mimic the colours of the sky in real time. Read about all the details here and watch the video below, courtesy of Tourism Montreal. Some of the best locations to enjoy the illuminations are the Old Port of Montreal, (especially the Clock Tower pier), and Notre-Dame Street, east of the Jacques Cartier Bridge. Avudo is a multimedia experience inspired by the city and St-Lawrence River’s history. It’s set up on the water across from the King Edward Pier (where the seats are located) in the Old Port. Video and images are projected on a “wall” of 94 shipping containers (11 stories tall in one place), as well as on the mist created by 30 or so water jets that act as projection screens. Dancing fountains complete the visuals. The show last 30 minutes and is set to music. I have to admit that Avudo surpassed my expectations, given that it is a completely free event. This is the kind of thing that you would expect to see in Vegas! You need to reserve your tickets online in advance though, as the seats are all assigned. There are two shows a night (9:30 and 10:30 PM) from Thursday to Saturday (also Wednesday in July). Here is a short video I made to give you an idea of what it looks like. 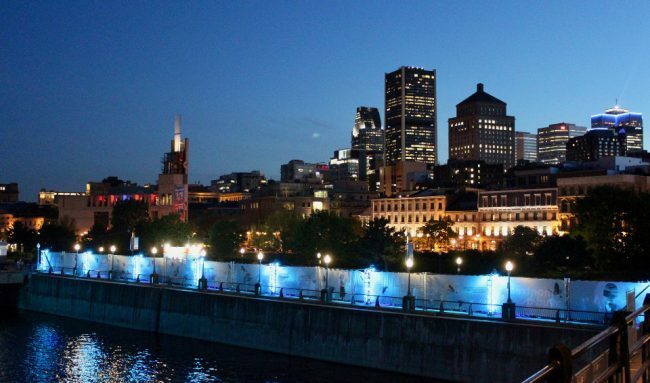 Cité Mémoire combines a walking tour with large-scale videos projected on various buildings, cobblestone streets, and even trees, throughout Old Montreal. Historical characters re-enact the city’s evolution over a series of two dozen tableaux. You can chose between several circuits. This event started last year, but this summer there are four new tableaux, including the Grand Tableau projected on the imposing walls of the Montreal Courthouse (near Champ-de-Mars metro). The event lasts from dusk until midnight every evening, with the Grand Tableau coming to life every hour on the hour. The catch: you either need to download an app (free), or take a guided tour (not free). Unfortunately, the fussy app refused to install on my phone. According to the organizers, the app only worked on devices equipped with an accelerator (whatever that is) but this is now being fixed. Moral of the story: if you want to use the app, don’t wait until the last minute to try downloading it. You can see their introduction video below. If you haven’t maxed out on illuminations and projections yet, Notre-Dame Basilica is the site of a multimedia spectacle called Aura, an expensive and exclusive show that allows neither filming nor photography. Their site has a video if you want to see what it looks like. If you’ve never been inside the Basilica before, it may be worth the cost as the normal admission fee is $6 and a guided visit costs an extra $12 anyway. Before the immersive sound and light event begins, you’re invited to wander around the church and explore its artwork. This year is also the 50th anniversary of the 1967 International and Universal Exhibition, which put Montreal on the map. It was the most successful World’s Fair of the 20th century with the most attendees to that date and 62 nations participating. I was 4 years old during Expo 67, and even though my parents took me there, I believe most of my memories came from later visits to the site, and repeated exposure to photos, and stories. If you were there and want to revisit those memories, or want to see what the fuss was all about, you can check out the following exhibits. 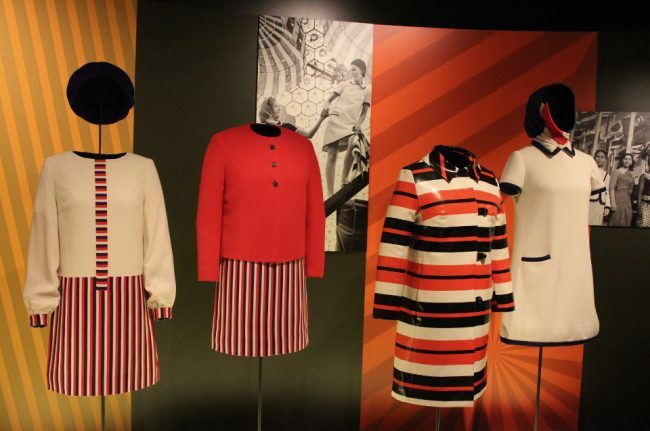 Mostly focusing on the fashion aspect of Expo 67, the temporary exhibition at McCord Musem is called “Fashioning Expo 67” and displays some of the uniforms worn by the hostesses of different pavilions, as well as various fashion shows and unique clothes designed for the occasion. Fashion was even used as a promotional tool for Expo 67 around the world. Michel Robichaud, a young Quebec fashion designer at the time, played an important role. I did check out this exhibit, and for me the most interesting parts were the videos (where you can actually see people wearing the clothes – so very 60s!) as well as the explanation panels that really made my adult brain realize how exciting and important this event was, not only for the Canadian fashion industry, but for Quebec and Canada’s self-image. Located on Ile Ste-Hélène, part of the original site of Expo 67, the Stewart Museum hosts a temporary exhibition called “Expo 67: A world of dreams”. It focuses on the technological innovations featured at the pavilions and the dreams that became a reality at Expo 67. You’ll be able to use VR goggles to view a presentation of the “In the Labyrinth” multi-screen film as it was shown in its eponymous pavilion. This was groundbreaking technology at the time, and the precursor to today’s IMAX format. You can also peruse video archives as well as slides and artefact belonging to three private collectors. The museum also offers a historical walk to discover the island of Ste-Hélène, its trails, and its history every weekend day at 3 PM. Only a few of the original buildings remain from Expo 67. One of those, the former pavilion of the United States, a geodesic dome called the Biosphere, is now (you guessed it) illuminated with a new lighting design and will be a permanent beacon of light in the Montreal sky for the next 20 years. This is just the tip of the iceberg. There are a lot more things to do in Montreal this summer, including all the special events scheduled for the 375th anniversary. Check out the Tourism Montreal website for all the details. If you’re visiting Montreal for the first time, put at least one day aside (preferably two) to do this self-guided walking tour through the top sights. I also recommend Lonely Planet’s Montreal & Quebec City guide to give you a good introduction to the city. Your first visit to this charming city probably won’t be your last!